The Planeswalker and dragon mage, Sarkhan Vol, left his time to travel back more than 1,200 years into Tarkir's past and save Ugin, the Spirit Dragon from death. By saving Ugin, Sarkhan ensured the dragon tempests would continue to thrive on Tarkir, and thus he saved the dragons—or so he hopes. After he created a magical, protective hedron cocoon around the fallen Ugin, Sarkhan was ripped back through time to his present. Now he is left to wonder how much change his actions caused. 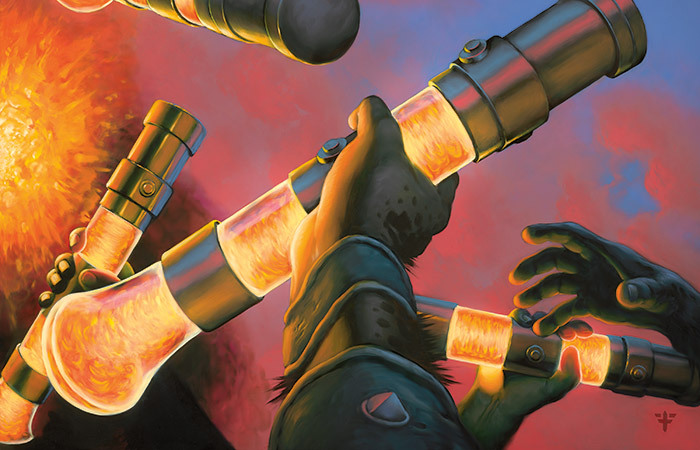 How many ripples propagated out across Tarkir's history? And who will share this new world with him? Who will glory in a Tarkir of dragons? Sarkhan Vol was going home. Yes. He felt it with utter certainty as he was whisked through the endless eternities. Whatever forces had thrust him back in time had now conspired to return him to—where was he going? The future? The present? The now? It did not matter what it was called, it was home. Time passed him by, countless years, untold centuries; the history of Tarkir tore through him in the matter of a single heartbeat. As solid ground coalesced beneath his feet and the world took shape around him, Sarkhan breathed for the first time a breath of this new Tarkir of now. The depths of his stomach stirred with the fullness of it. He was standing before the hedron cocoon, exactly where he had been a mere moment before—no, hundreds, or perhaps thousands of years before. If he had been a man of lesser awareness, if he had not understood the chain of time, he might have guessed that he had never left; he might have surmised that he'd had an episode of vertigo or that he'd simply lost his bearings. But even then, even if he was not in tune with temporal forces and the flow of history, he could not have missed the clues on the cocoon itself that spoke of the passage of innumerable years. 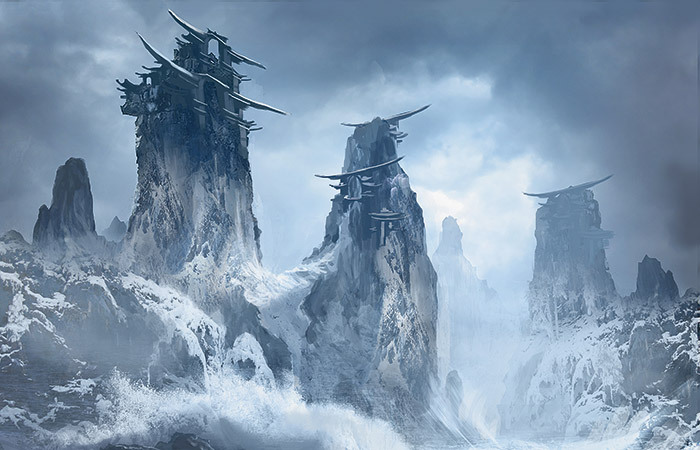 Sheets of ice covered the sides of the hedrons, icicles hung from the points and edges, snow had collected in the ruins, and there were grooves and cracks in the exposed portions of rock, worn by time. The evidence was all there, the truth was unavoidable: time and history had come and gone in a blink of Sarkhan's eyes. "Ugin." Sarkhan spoke the Spirit Dragon's name, his voice quavering, as though testing its credibility in this new time. "I'm here, Ugin. I'm here." He reached out to the cocoon with trembling fingers. For a moment the only answer was the whistling of the wind. Then a bellow sounded from above. Sarkhan turned his eyes to the sky and a burst of giddiness erupted in his chest—an entire herd! Dragons were circling overhead. "Ha ha!" he cried. "Look! Just look at them!" He had not been wrong to hope. It had happened. It had worked. 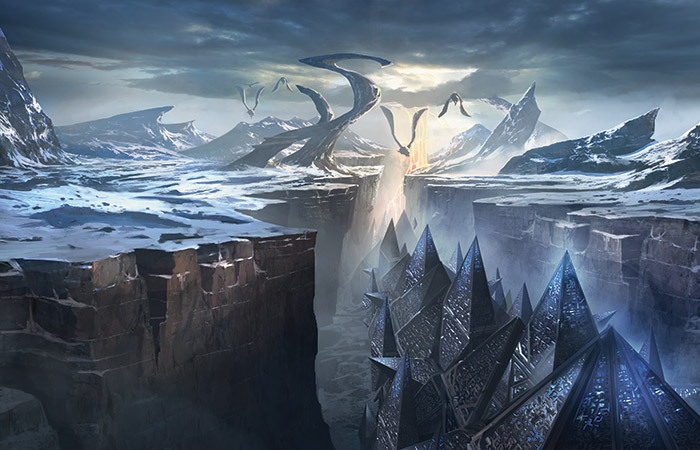 The hedron shard that had saved Ugin's life had saved the dragons of Tarkir. Tears sprang to Sarkhan's eyes, wet and hot. Real. This was real. "You have to see this!" Sarkhan called to Ugin. "I've done it! The chain of time has been reforged!" But the Spirit Dragon did not stir. No matter. Sarkhan was here. He tossed his head back and let out a whooping cry that blasted across the land. As the cry echoed back to him, it turned into a roar, a guttural roar, a dragon's roar. And in his dragon form, Sarkhan Vol took to the sky. He shot up, up, up, gaining altitude so quickly that the skin of his snout pressed back into his eyes. He careened headlong into the herd of dragons above, buffeting off their thick hides, weaving around them, awash in the turbulence kicked up by their heaving wings. He recognized the dragons; they had antlers and broad shoulders. They belonged to the brood that Yasova and her sabertooth had attacked—when? A millennium ago? Yasova. Tenacious, powerful Yasova. What she had done was not her fault. She had played her part just like him. He could not be mad, not at her, not at anyone, not anymore. No, everything felt too right. His head was clear, his thoughts were his own, and his Tarkir was full of dragons. Sarkhan wanted to grab the beast at his side, he wanted to shake her and say, "You're here! You're here on Tarkir because I made it so!" But his dragon lips could not form the words, so instead he turned to the dragon beside him and bellowed with all of his might. Her great eye blinked at him. Did she understand? Could she understand how wonderful, how amazing, how impossible this was? He trumpeted again and again as he zigzagged through the herd. His energy was like a spark in a haystack, igniting the other dragons around him. They joined Sarkhan's voice, meeting him roar for deafening roar. One exhale charged the next inhale, picking up intensity, volume, and speed as it went, growing into an all-consuming force that took hold of every dragon in the herd and united them in one moment, one collective breath. They roared as one, and all of Tarkir trembled. 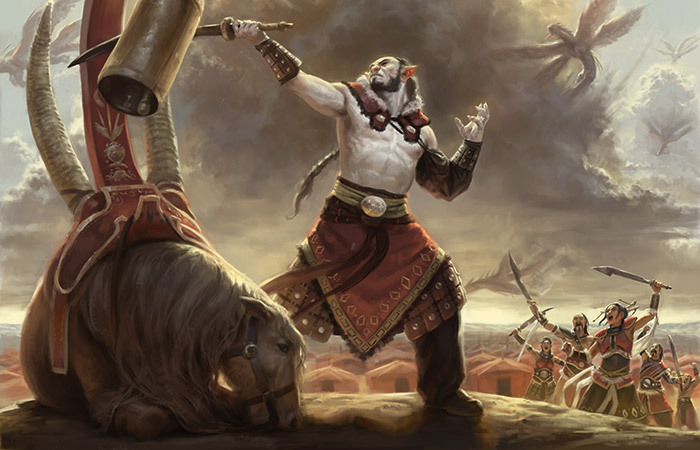 As Sarkhan soared with his adopted herd, he took in the new world of Tarkir. There was so much he recognized, so much he knew, and yet it was all so different. He could see other herds in the distance, some that looked the same as the antlered herd he flew with, and others that were utterly different. There were sleek dragons that glided like feathers on the currents; there were dragons with thick armored scales that flew far below and close together. And there were those that acted more like serpents, spending their time in great temples in the marshes, which Sarkhan only glimpsed from above. The land itself had changed, too. Where once there had been ruins and piles of dragon bones, now there were fields and forests. The snowy tundra that in a different time was blanketed in endless white was now only partially covered; large swaths of it were charred black. Dragonfire! Sarkhan dropped into a spiraling dive of glee, letting the aroma of burnt undergrowth flood his nostrils. This land had changed because there were dragons here! As he shot back up into the herd, he was greeted by nothing less than the sight of a dragon tempest rupturing before him. From it emerged more dragons. And the new fledglings joined the cry. It was everything Sarkhan had ever wanted. He could live like this forever. What a world! What a time! What perfection. But Sarkhan's perfect moment was shattered by the sudden, grating peal of a bell. The sharp, metallic sound cut through the herd like a knife, ringing out again and again. Dragons scattered, breaking off and away, issuing urgent cries. Sarkhan was battered about by snouts and wings and thick, kicking legs. He could sense their distress and could not help but feel it too. But a bell, he thought, should not be the cause of such upset in a herd of mighty dragons. He glimpsed down in the direction of the intrusive sound. There on the ground, standing in the middle of what looked very much like a sparse Mardu encampment, was a figure striking a bell. A mere human. Or was it an orc? Even so, what kind of threat could such an insignificant creature pose to a herd like this? His answer came the very next moment. Like a spout of volcanic magma, a stream of dragons erupted up out of the encampment, shooting into the sky. They beat their wings in time with the bell—the bell that a Mardu orc was striking. Even in his state of alarm, Sarkhan thrilled at this. Dragons and clan members living in the same encampment; dragons and clan members working together! It was just as it was supposed to be. 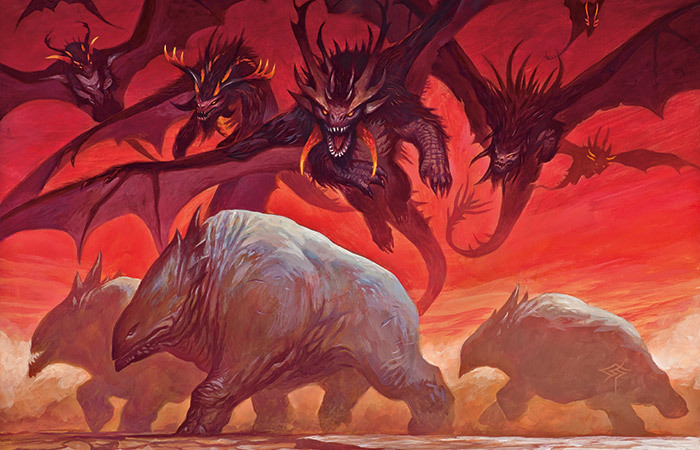 But he could not rejoice for long, for the dragons of this Mardu herd, a fifth unique brood he had not yet seen, were faster than a barrage of flaming arrows. The attack was led by an ancient and powerful dragon with a leathery fringe that encircled her face, and horns that lined her snout and back. She was made for speed, her body agile and taut, her wings strong…and she was barreling straight at Sarkhan. For an instant, time stood still. Sarkhan looked into the great dragon's eyes. He recognized her face, the shape of her snout, the cut of her jaw. It was so familiar. But how could it be? He had never seen this dragon before. He couldn't have. And yet…as he squinted down at her, the clanging of the bell rattled an image out of his mind. It was a memory from the time before. For the space of a heartbeat Sarkhan could see two Tarkirs, one inlaid over the other. Shooting toward him was both the dragon of this now, flesh and blood and scales, and the dragon of the now that had been lost forever, nothing more than an empty, rotting skull, a khan's throne. That is why he knew this dragon. Oh how the world had changed! 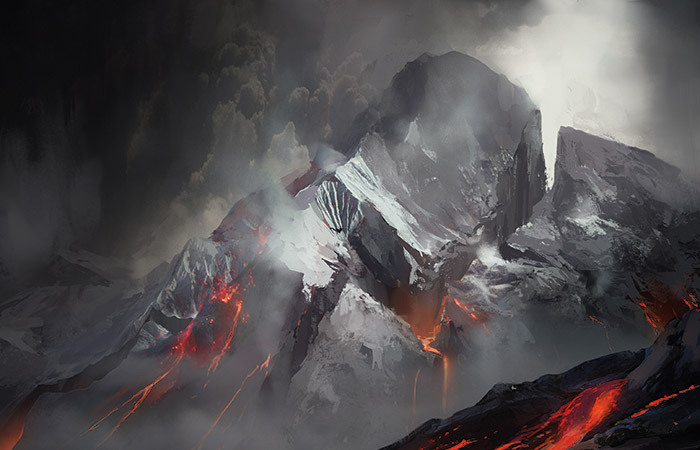 A fierce roar collapsed the two histories back into one, and Sarkhan shook free of the thrall just in time to dart out of the path of the ancient dragon. As she led her herd upward, he careened down. He was small enough to be missed, small enough to be ignored, and for that he was grateful. He did not wish to do battle with the ancient dragon. Heart pounding and mind reeling, Sarkhan landed and took his human form at the edge of the encampment. He sought shelter under the protection of a rocky outcropping as the dragons of the two herds clashed in the sky above him. Listening to the echoes of their bodies cracking, he gloried in the dawning realization of what he had truly done. These dragons were only here because of his actions. Even the mightiest among them owed her existence to Sarkhan Vol. He had made this Tarkir. He had made it and it was glorious. Sarkhan started at the voice. It came from below rather than above. "Intruder! Attack!" An angry goblin charged out of the bush to his right…a goblin that Sarkhan recognized. She was dressed differently than he remembered. She didn't wear a cape, and she brandished a thick vial rather than her blade, but it was her. It was definitely her! 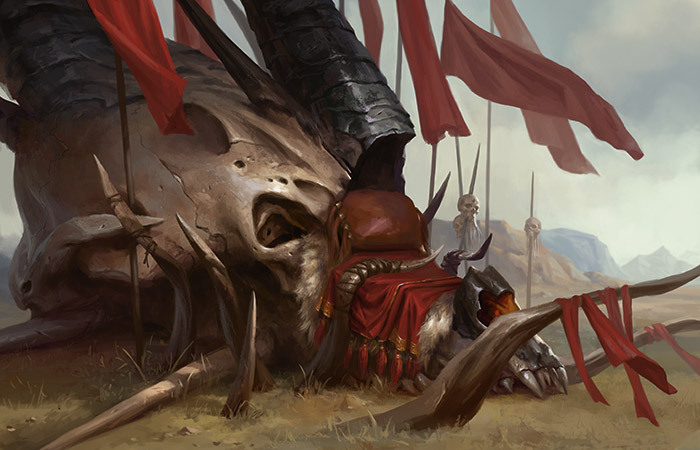 Sarkhan's heart soared at seeing her—at seeing her in this time, in his new Tarkir, and alive! "Ankle Shanker!" Sarkhan ran out from under the outcropping and opened his arms so that the raging goblin hurtled into his embrace. He could not contain his delight. He shook her enthusiastically. "You're here! You're alive! Just like the dragon." "Put down! Madman! Madman! Put down!" "Was it a dragon that saved you? It must have been! Or was it that your life was never threatened at all in this time?" "A threat! A threat on life!" Ankle Shanker spat at Sarkhan, her hot saliva dripped down his cheek. "Madman life will end! Unhand Vial Smasher! Now!" "Your name! Ha ha! Even your name has changed!" Sarkhan's mind struggled to make sense of it all. A million changes, differences, details—"Wait. You say I'm an intruder? You don't know me?" "Intruder!" Ankle Shanker, known as Vial Smasher, bit him. She dug her thick, flat teeth into the skin of Sarkhan's wrist, grinding down with the force of her jaws. He threw her away and cried out in pain, but his cry turned into a laugh, a joyous laugh. "You are even stronger than you were before. You're stronger and you're alive!" "Manic! Raver! Stay back or Smasher smash!" Vial Smasher rattled the vial she was holding. The hairs on her arms stood on end as though electrically charged. "Dragonfire," Sarkhan whispered. "They share it with you? The dragons give their fire to the clan? That's perfect. It's all so perfect!" "Smasher smash!" She wound up. "Stop!" Sarkhan said, but too late. The goblin launched the vial. 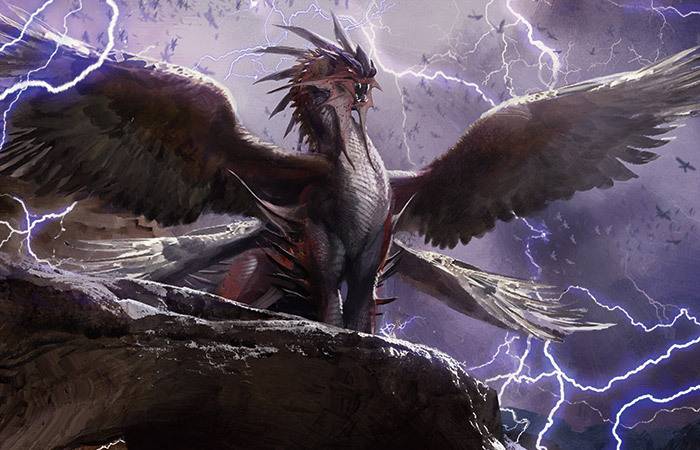 As it shattered on the ground, Sarkhan transformed into a dragon and dove in front of Vial Smasher, spreading his wings to form a protective shield around her. Her outcries hushed immediately and Sarkhan could feel her trembling beneath him. He looked down at her as he transformed back into a man. She was in a prone position, bowing before him. "Dragonman." She glanced up at him and scampered back. "No smash. Smasher no smash dragonman. Smasher didn't know. Smasher sorry. Don't hurt Smasher. " She backed away, her eyes darting around, looking for an escape. "What's going on down here?" The booming voice of an orc made them both turn. "I saw a flash of dragonfire, but I know that all the dragons are in the sky. What have I told you about wasting—" The orc broke off at seeing Sarkhan. Zurgo grunted. "Don't tell me, Vial Breaker, that you wasted dragonfire on this pathetic excuse for a raider." "Smasher! Vial Smasher, not Breaker! Zurgo Bellstriker know." The goblin balled her fist and growled. "Zurgo Bellstriker bad orc. Bad." "Bellstriker?" Sarkhan balked. "Zurgo, Bellstriker?" He looked from Zurgo to Vial Smasher and back again. "He is—you are the bell-striker?" As his eyes alighted on Zurgo's sword he saw this was true. The blade was dull, not from war but from striking a great metal bell. Zurgo was the figure Sarkhan had seen from above. "You dare laugh at me, wretch?" Sarkhan ran his fingers through his hair, piecing it all together. "But you were Helmsmasher, you were—"
"Not Smasher. He Bellstriker," the goblin interrupted. She pointed to herself. "I Smasher." Sarkhan ignored her. He searched Zurgo's face. "You once led the Mardu." "Enough!" Zurgo bellowed. "Enough of your disrespect." "Mardu who?" Vial Smasher asked. "Your clan. Our clan of warriors," Sarkhan said. "Who is khan now?" "No khan! No say khan!" The goblin launched herself at Sarkhan and threw her hand over his mouth. "Kolaghan Dragonlord kill khan-sayers." "Dragonlords," Sarkhan echoed through Vial Smasher's hot hand. She was clinging to his side now. "There are dragonlords and no khans?" "No say khan!" the goblin pleaded. "Get off him, Breaker," Zurgo spat, swatting the goblin away. "I say let the man speak if he wants death. Go ahead, stranger, call your words to the sky. Make your affront to Kolaghan herself." An unsettling feeling tugged at the corner of Sarkhan's gut. "You think I'm a stranger too?" he asked. "You don't know me, Zurgo?" "Why would I know a lowly vagrant?" "I am not a vagrant. I am—how could you not remember? How could you not know? I am Sarkhan Vol!" "Don't say khan, don't say khan." Vial Smasher covered her long ears and rocked back and forth. "Vol?" Zurgo laughed. "Is that a feeble Atarka name?" "No, it's my name." Sarkhan's voice was quiet. "Don't you know it at all?" There was no recognition whatsoever on the orc's face. How could this be? Things were different, yes, but how different? How could no one know him? Was it possible that these were Sarkhan's first moments here in this time? When he made a new now, had his past been lost? "Vol is a pathetic name for a pathetic man. Vol should fall easily." Sarkhan heard Zurgo's words as though from a very distant place; his mind was too busy combing through the knots of time, parsing the implications of what he had done. Zurgo raised his blade just as Sarkhan unthinkingly took his dragon form. Sarkhan's thoughts briefly settled on the dull, useless edge of the orc's blade. It was a bell-striker's blade. "But you were once khan," he said as he transformed. Or perhaps he merely thought the words, for Vial Smasher did not shout. Both orc and goblin stood in paralyzed stillness as Sarkhan Vol launched himself into the sky. It wasn't until he pushed up to crest the first mountain that he heard the peal of Zurgo Bellstriker's bell in the far distance. Disjointed thoughts tumbled through Sarkhan's mind as he heaved himself through Tarkir's sky. This was his Tarkir, the Tarkir he had made, and yet no one knew him here. It was as though he did not exist, as though he had no history. His stomach lurched and he thought for a moment that he would be sick there in the sky. But he swallowed it and attempted to rein in his bumbling thoughts. Did it truly matter that he was not known? He was here now, was he not? And Tarkir was perfect. That was what mattered. Even if no one here knew him, even if he himself did not have a history, Tarkir had a brilliant one because he had made it so. Dragons had survived—no, they had flourished. And so too had the clans; Vial Smasher was proof of that. She had lived here when in another time she had met her death. At that thought, Sarkhan's breath caught and his wings ceased their flapping. If Vial Smasher's fate had been altered, and Zurgo's, and the great dragon's too, then the same could be true for another. The same could be true for…Narset. Of course. It was obvious. Why hadn't he thought of it before? Zurgo would not have killed Narset in this now, not with his dull, useless sword. Their paths would never have crossed at the chasm. She would never have led Sarkhan there. She would never have had to lay down her life. She would be here. She would be alive! Sarkhan pulled himself out of his paralyzed dive. Narset! He barked the name out across the land. This world, the wonder, the balance, the perfection, Narset would know it. She would rejoice in it. And he would tell her that he had made it so. Sarkhan hastened to the Jeskai territory. He believed he would find Narset there, for in another time she had been khan of all that stretched along the river. But when he arrived, he learned that a dragon called Ojutai ruled in her stead. Dragons seemed to rule everywhere in this now; that was as it should be. Sarkhan learned from Ojutai's followers that the sleek, agile dragon was the oldest and wisest being on all of Tarkir. Those who lived in Ojutai's territory called him the Great Teacher and held him in high esteem, longing for his enlightenment. In turn, the dragon respected his students. He taught them what he knew, sharing his insight and his wisdom to help each of them grow stronger and more cunning. Sarkhan knew that of all of Ojutai's pupils, Narset would be the best. She would have risen to the top. And of course, he was right. He followed word of her name up and up, ever closer to Ojutai's roost. The dragon's perch was at the top of a tower, which Sarkhan recognized as a stronghold, but in this time was called Dragon's Eye Sanctuary. The closer he got to the top, the more right everything felt. This was where she must be; Narset at the highest perch in the land; Narset in the sky with the dragons. His insides stirred at the thought of it. When Sarkhan reached the topmost room, he thought it to be empty at first. But his eyes caught a slight movement, the heaving of a chest for a shallow breath. There was a figure sitting in a meditative pose, still as a statue, on the far side of the room. He nearly raced across the floor to embrace her, but then he realized the figure was not Narset. He came up short. "Who are you?" The words came out without his thinking. The figure lifted his head to the light and Sarkhan could make out the man's features. He was a perfect specimen—everything a human trained by dragons should be. Power radiated off him. "I am Master Taigam." The man's voice was as smooth as the skin on his head. "And you are a student come to seek knowledge and wisdom. You have come a long way, traveler. Welcome to Dragon's Eye Sanctuary." "No, I—I'm not a student. I've come to find her. Where is she?" Sarkhan glanced about the room for a second time, but there was nowhere to hide in the clean, open space. "Is there somewhere higher?" He looked up. "Higher?" Master Taigam chuckled. "There is nothing higher except Ojutai himself." Master Taigam's eyes widened ever so slightly and then slowly closed. They remained that way for more moments than felt comfortable. Sarkhan's excitement turned to question and then to worry. He waited until he could contain himself no longer. "Do you know her? Narset? I have to find her. She will understand. She'll understand everything." Master Taigam's eyes opened even more slowly than they had closed and he tilted his head up ever so slightly so as to look Sarkhan in the eye. "Narset is not welcome in the Dragon's Eye. She was a heretic, and for that she was punished to full extent of the law. Do not look for her here. She is long gone." "Gone? Where? You must tell me." Master Taigam let out a controlled breath. "Narset is no more." "No more?" The blood drained from Sarkhan's head, he staggered. "But that can't be." "It is as it is." Master Taigam's lip twitched. "She met her fate. And any who seek out a heretic shall meet the same." "She is not a heretic. She is—she is everything." "I will hear no more." Master Taigam waved his hand in a gesture that was so strong that the force of it pushed Sarkhan toward the door. He gripped the wall, straining to hold on against Master Taigam's power. "You don't understand. She has to be here. This is a world for her. A world of dragons—for her!" "Leave, heretic." With another wave of Master Taigam's hand, Sarkhan was thrust through the door and sent tumbling down the stairs. Sarkhan's mind reeled as his legs flailed, taking him down, down, down. 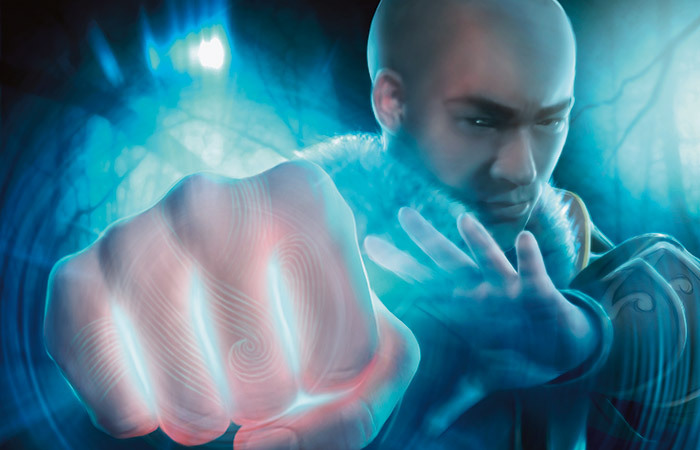 He did not know what force was pushing him now—Master Taigam or his fear. This could not be. Narset was not supposed to die. Not this time. Not on this Tarkir. He careened out into the light, fumbling his way through a marketplace. "No." He shook his head, pulling at his hair. "No, no, no." He began to run. He had to move. He had to get away. He had to change this. "No!" With a cry, Sarkhan shifted into his dragon form and took flight. If Vial Smasher was alive, if long-dead dragons still flew in the sky, if Zurgo the khan was a bell-striker, Narset must be here. She had to be here. As he flew over Tarkir, Sarkhan could not look down. The world that had seemed so perfect before, so glorious, was now marred and ruined. Without her, this place was nothing. Sarkhan's trembling mind clutched at the thought of the Spirit Dragon. Ugin would know. Ugin, whose voice had led Sarkhan across time. Ugin, whose power flourished on this now. Ugin would know. Ugin would know how to make this right. Sarkhan thrust his wings with new resolve. It was time to wake the Spirit Dragon.